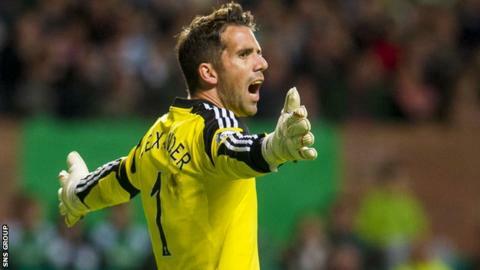 Goalkeeper Neil Alexander is looking forward to his first Edinburgh derby and says Hearts are brimming with confidence ahead of Sunday's game. The 36-year-old missed Hearts' 2-1 victory over Hibernian at Tynecastle in August because of an injury. But he has played in the last seven matches, with Hearts now nine points clear at the top of the Championship. "We're delighted with where we are and we believe in what we've got in the dressing-room," said Alexander. "Being top of the league. obviously folk want to beat us regardless if it's Hibs or anyone else. "We are that scalp that everyone wants to take because we are playing well. "So there is pressure on us, but, with Hibs being the home team in a derby, it's probably even. "We've brought that on ourselves with how well we've done. There's been pressure in every game this season and we've come through with flying colours. "We have nothing to fear and Sunday can't come quick enough. "The manager has made some really good signings, adding to the youth we had last season. We have a fantastic blend of experience and youth. "I'm not surprised by our start. We are matching our expectations." Hearts have won nine and drawn one of their 10 league matches, while Hibs are 14 points off the pace in fourth place and have won only one of the last six meetings between the city rivals. And, while he is yet to experience the occasion as a player, Alexander has good memories of the derby. "Growing up a Hearts fan, this was always the biggest fixture of the season," he explained. "My dad was a Hibs fan and I used to give him a bit of stick because we won more than we lost. I loved the derbies. "I've played in Old Firm games, but this is a new one for me and I'm really looking forward to it." Alexander, who had spells with Cardiff City and Rangers, is buoyed by Hearts' impressive form but knows high standards must be maintained. "We're just into the second quarter and it's a marathon not a sprint," he added. "I'm sure Rangers and Hibs will go on runs and it's a tough, tough league, especially games away from home. You are going to drop points here and there. "There's a long way to go, but, if we can keep people fit and keep confidence high, there's no reason why we can't be there at the end of the season."